Daredevil 116 was a slow-burner, full of the death, misery and despair that Ed Brubaker serves up so well. 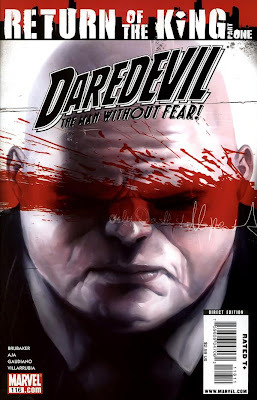 Concerning itself with setting up the return of Wilson Fisk AKA Kingpin, the mood was sombre and foreboding as we see the tragedy behind the imminent reappearance of the former King Of New York, and the reasons behind a (likely) alliance with Matt Murdock….An issue that got under the skin of Fisk, to the point that you felt his pain when the inevitable tragedy strikes. No Daredevil, just Kingpin. Great cover art as well. 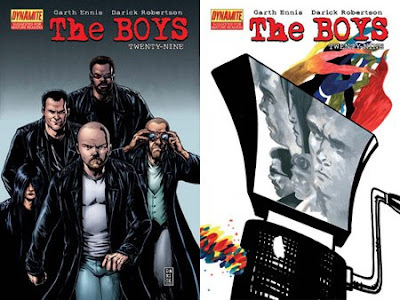 The Boys 29 was simply one of the best that this mostly excellent title has put out so far. As Hughie’s undercover mission threatens to end painfully, The Female and The Frenchman turn up, and Billy gets the unsettling truth behind Godolkins recruitment of the young and gifted. Setting itself up nicely for issue 30, this was a very entertaining read, and as a whole, ‘We Gotta Go Now’ has been one of the best arcs.